I love this first kitchen with the pops of green. The countertops are Carrara marble. 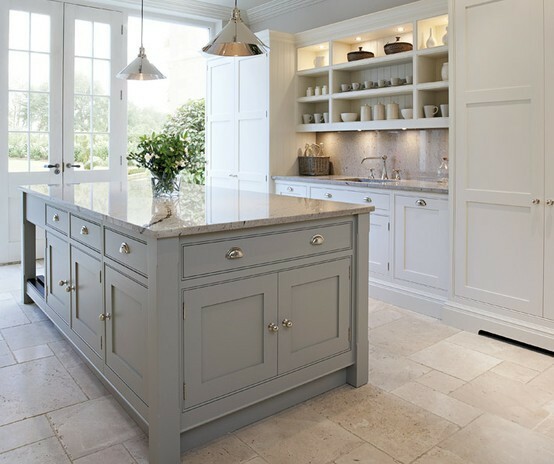 This kitchen mixes a grey island with white cabinets on the perimeter. The countertops look like they are granite, but I can't tell exactly what color. Another beautiful white marble kitchen countertop. The subway tile backsplash has a greenish tint, I like how this adds some depth to the kitchen. Also, notice the detail on the ceiling. Beautiful kitchen! The countertops are hard to see, they are a cream colored marble, the website doesn't name them specifically. This kitchen is really pretty, you can see more pictures of it here. This last kitchen is my favorite of the day. 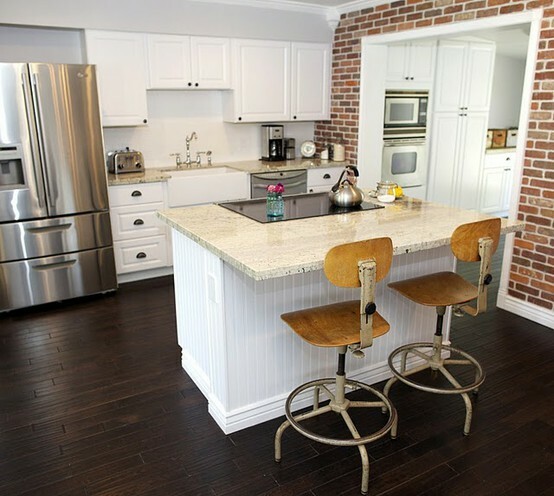 I love the red brick wall and those barstools are awesome. The countertops look like Kashmir White granite.